Mortgage bonds continue to battle the overhead resistance level we have mentioned the past several days. So far they have not been successful in winning the fight. Since today is a Federal Reserve Rate Decision day, the markets will likely continue to show high levels of volatility. Although a Fed rate hike is not expected to be announced, investors will be analyzing each word spoken by Fed President Janet Yellen for any clue as to when the first rate hike will take place. Given that the Fed has not had an increase to the Fed Funds rate since June of 2006, it has been a full nine years since we have been in this position. At this point the market is anticipating a rate hike in September. However, there still exists the chance that it will be pushed back to 2016. Many still believe that we are still in middle of a significant move higher in mortgage rates. 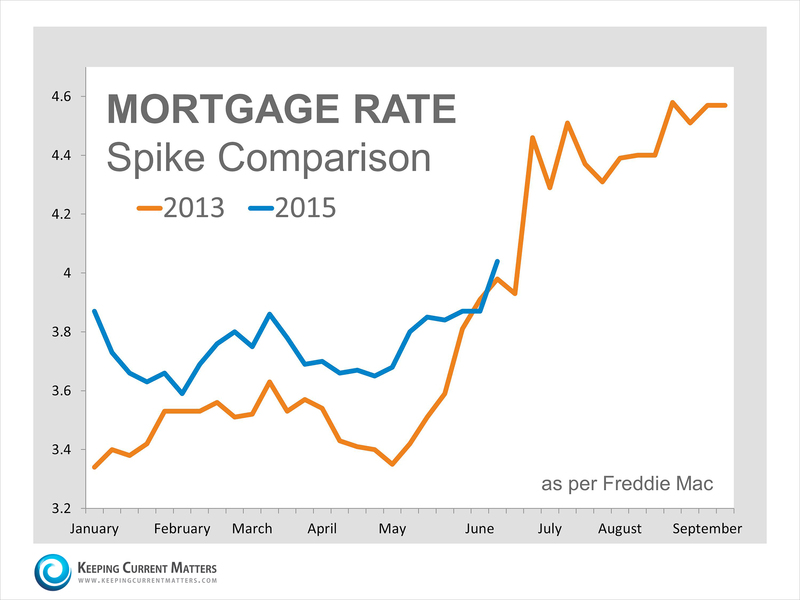 Keeping Current Matters posted a graph comparing the recent spike in mortgage rates to the one we experienced back in 2013. It clearly shows similarities in the patterns of movement. If the trend higher continues, we certainly have a steep climb higher ahead of us. Let’s hope this pattern is not repeated and that the market will level out quickly. Given the current status of the market and the increased volatility with the pending Fed announcement, locking is still the prudent strategy. Be on guard this afternoon to see how the market responds to the Fed announcement and policy statement. It could help dictate the near term direction of mortgage interest rates going forward.